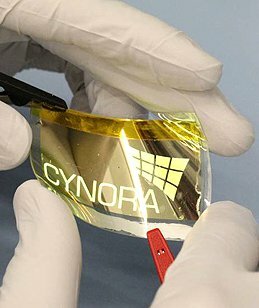 Cynora is a German startup established in 2003 that developed copper-based OLED emitter systems. In October 2012 the company unveiled a mostly-solution-based flexible OLED prototype, developed in collaboration with InnovationLab. Last month Germany’s BMBF launched the cyCESH project which aims to develop soluble (printable) materials for low-cost high efficiency OLED lighting devices. Cynora is the leader of the consortium in this €6 million project, together with Novaled and the University of Regensburg. Cynora's technology is interesting and the company's CEO Dr. Tobias Grab and the company's Business Development manager, Dr. Mathias Mydlak, were kind enough to provide the information for this article explaining the company's technology. 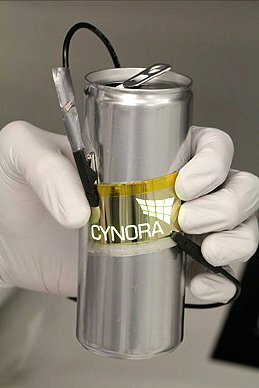 Cynora develops soluble copper-based OLED emitter and host systems to provide an EML solution for OLED devices (both displays and lighting). This will become an alternative to iridium-based solution-processed phosphorescent OLEDs, but without any rare metals. The EML materials can be made crosslinkable without any additives. Cynora's emitters are not phosphorescent, they use the Singlet-Harvesting Principle, or Thermally Activated Delayed Fluorescence (TADF, also called delayed fluorescent). The idea is basically opposite to phosphorescence: triplet excitons are transformed into singlet excitons which are then used for light emission. See the slide image above for some more details. A few months ago we reported about new research at Kyushu University - and these guys also use TADF to achieve high OLED efficiency without phosphorescence. Cynora aren't affiliated with Kyushu and their research is independent. 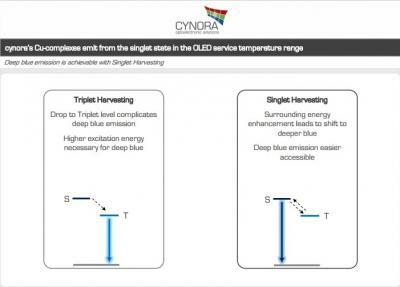 Cynora is currently focused on green and blue emitters and they say that TADF emitters are more promising for deep blue emission because triplets are lower in energy than singlets. Cynora says that the green performance has progressed to the range of 20 cd/A while a brightness above 10 k cd/m2 is achievable These devices do not include any outcoupling efforts and are constantly improved by Cynora and its partners. They are also developing a blue emitter system. They have produced the first blue device in past weeks but they are not ready to provide results yet. The company is currently busy developing the technology further and setting up new R&D equipment at their new premises. Hopefully we'll get some updates in the next few months as this equipment is put to use. 10.000 cd/m2 from a green OLED may be a bit misleading to people not familiar with the metric behind these units. Candela are linked to the sensitivity of the human eye which has it's maximum in the green. So it is far easier for a green OLED to reach a high value for cd/m2 than it is for a white OLED. The difference typcially is a factor somewhere between 3-6.